Research Interests and short bio: Evangelos Kalogerakis' research deals with the development of visual computing and machine learning techniques that help people to easily create and process representations of the 3D visual world, including 3D models of objects and scenes, 3D scans, animations, shape collections, images, and video. His research is supported by NSF awards as well as donations from Adobe and NVidia. He received the NSERC Alexander Graham fellowship and the international EPFL Dimitris N. Chorafas award for his PhD work. 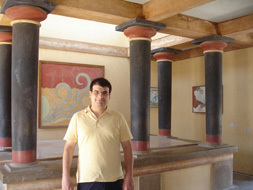 He graduated from the department of Electrical and Computer Engineering, Technical University of Crete in 2005 (undergraduate thesis advised by Stavros Christodoulakis). He obtained his PhD from the University of Toronto in 2010 (advised by Aaron Hertzmann and Karan Singh). He was a postdoctoral researcher at Stanford University from 2010 to 2012 (advised by Leo Guibas and Vladlen Koltun). He joined the Computer Science department at UMass Amherst in 2012. Abstract: Object functionality is often expressed through part articulation -- as when the two rigid parts of a scissor pivot against each other to perform the cutting function. Such articulations are often similar across objects within the same functional category. In this paper, we explore how the observation of different articulation states provides evidence for part structure and motion of 3D objects. Our method takes as input a pair of unsegmented shapes representing two different articulation states of two functionally related objects, and induces their common parts along with their underlying rigid motion. 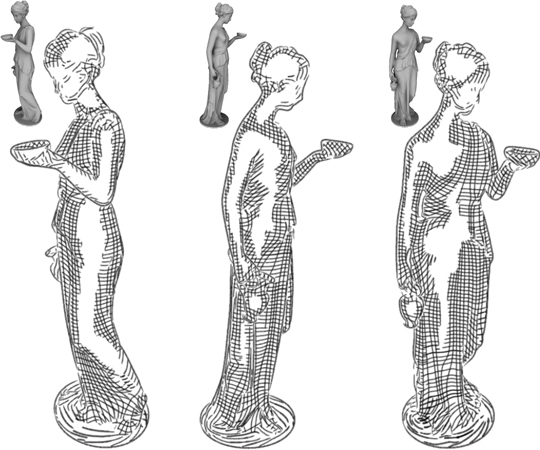 This is a challenging setting, as we assume no prior shape structure, no prior shape category information, no consistent shape orientation, the articulation states may belong to objects of different geometry, plus we allow inputs to be noisy and partial scans, or point clouds lifted from RGB images. Our method learns a neural network architecture with three modules that respectively propose correspondences, estimate 3D deformation flows, and perform segmentation. To achieve optimal performance, our architecture alternates between correspondence, deformation flow, and segmentation prediction iteratively in an ICP-like fashion. Our results demonstrate that our method significantly outperforms state-of-the-art techniques in the task of discovering articulated parts of objects. In addition, our part induction is object-class agnostic and successfully generalizes to new and unseen objects. Abstract: We present a novel deep-learning based approach to producing animator-centric speech motion curves that drive a JALI or standard FACS-based production face-rig, directly from input audio. 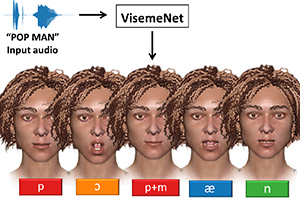 Our three-stage Long Short-Term Memory (LSTM) network architecture is motivated by psycho-linguistic insights: segmenting speech audio into a stream of phonetic-groups is sufficient for viseme construction; speech styles like mumbling or shouting are strongly co-related to the motion of facial landmarks; and animator style is encoded in viseme motion curve profiles. Our contribution is an automatic real-time lip-synchronization from audio solution that integrates seamlessly into existing animation pipelines. We evaluate our results by: cross-validation to ground-truth data; animator critique and edits; visual comparison to recent deep-learning lip-synchronization solutions; and showing our approach to be resilient to diversity in speaker and language. Abstract: We present a new local descriptor for 3D shapes, directly applicable to a wide range of shape analysis problems such as point correspondences, semantic segmentation, affordance prediction, and shape-to-scan matching. 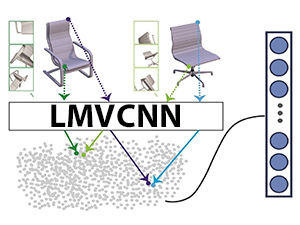 The descriptor is produced by a convolutional network that is trained to embed geometrically and semantically similar points close to one another in descriptor space. The network processes surface neighborhoods around points on a shape that are captured at multiple scales by a succession of progressively zoomed out views, taken from carefully selected camera positions. We leverage two extremely large sources of data to train our network. First, since our network processes rendered views in the form of 2D images, we repurpose architectures pre-trained on massive image datasets. Second, we automatically generate a synthetic dense point correspondence dataset by non-rigid alignment of corresponding shape parts in a large collection of segmented 3D models. As a result of these design choices, our network effectively encodes multi-scale local context and fine-grained surface detail. Our network can be trained to produce either category-specific descriptors or more generic descriptors by learning from multiple shape categories. Once trained, at test time, the network extracts local descriptors for shapes without requiring any part segmentation as input. Our method can produce effective local descriptors even for shapes whose category is unknown or different from the ones used while training. We demonstrate through several experiments that our learned local descriptors are more discriminative compared to state of the art alternatives, and are effective in a variety of shape analysis applications. Abstract: We present a network architecture for processing point clouds that directly operates on the collection of points represented as a sparse set of samples in a high-dimensional lattice. Naively applying convolutions on this lattice scales poorly both in terms of memory and computational cost as the size of the lattice increases. Instead, our network uses sparse bilateral convolutional layers as building blocks. These layers maintain efficiency by using indexing structures to apply convolutions only on occupied parts of the lattice, and allow flexible specification of the lattice structure enabling hierarchical and spatially-aware feature learning, as well as joint 2D-3D reasoning. Both point-based and image-based representations can be easily incorporated in a network with such layers and the resulting model can be trained in an end-to-end manner. 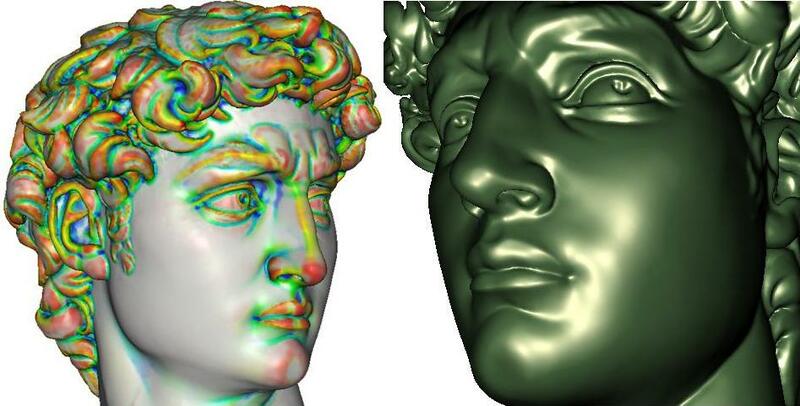 We present results on 3D segmentation tasks where our approach outperforms existing state-of-the-art techniques. Abstract: We present a neural architecture that takes as input a 2D or 3D shape and outputs a program that generates the shape. The instructions in our program are based on constructive solid geometry principles, i.e., a set of boolean operations on shape primitives defined recursively. Bottom-up techniques for this shape parsing task rely on primitive detection and are inherently slow since the search space over possible primitive combinations is large. In contrast, our model uses a recurrent neural network that parses the input shape in a top-down manner, which is significantly faster and yields a compact and easy-to-interpret sequence of modeling instructions. 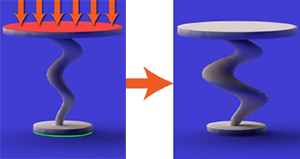 Our model is also more effective as a shape detector compared to existing state-of-the-art detection techniques. We finally demonstrate that our network can be trained on novel datasets without ground-truth program annotations through policy gradient techniques. Abstract: Material understanding is critical for design, geometric modeling, and analysis of functional objects. 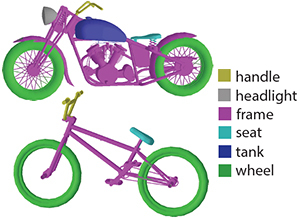 We enable material-aware 3D shape analysis by employing a projective convolutional neural network architecture to learn material-aware descriptors from view-based representations of 3D points for point-wise material classification or material-aware retrieval. 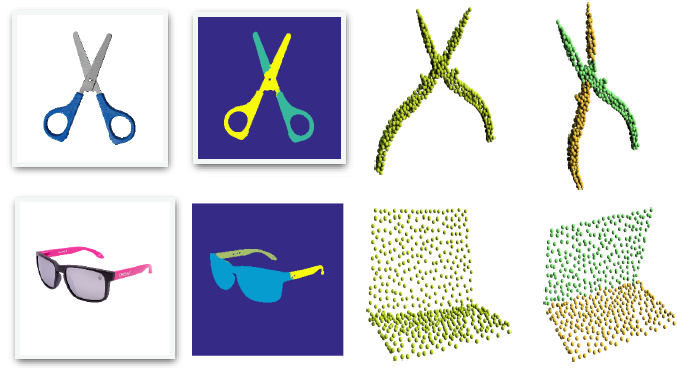 Unfortunately, only a small fraction of shapes in 3D repositories are labeled with physical materials, posing a challenge for learning methods. To address this challenge, we crowdsource a dataset of 3080 3D shapes with part-wise material labels. 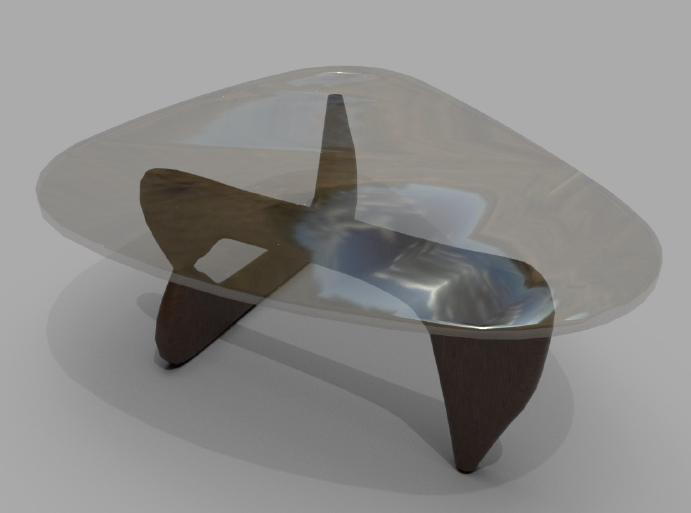 We focus on furniture models which exhibit interesting structure and material variability. In addition, we also contribute a high-quality expert-labeled benchmark of 115 shapes from Herman-Miller and IKEA for evaluation. We further apply a mesh-aware conditional random field, which incorporates rotational and reflective symmetries, to smooth our local material predictions across neighboring surface patches. We demonstrate the effectiveness of our learned descriptors for automatic texturing, material-aware part retrieval, and physical simulation. Abstract: We propose a data-driven method for recovering missing parts of 3D shapes. Our method is based on a new deep learning architecture consisting of two sub-networks: a global structure inference network and a local geometry refinement network. The global structure inference network incorporates a long short-term memorized context fusion module (LSTM-CF) that infers the global structure of the shape based on multi-view depth information provided as part of the input. It also includes a 3D fully convolutional (3DFCN) module that further enriches the global structure representation according to volumetric information in the input. Under the guidance of the global structure network, the local geometry refinement network takes as input local 3D patches around missing regions, and progressively produces a high-resolution, complete surface through a volumetric encoder-decoder architecture. Our method jointly trains the global structure inference and local geometry refinement networks in an end-to-end manner. We perform qualitative and quantitative evaluations on six object categories, demonstrating that our method outperforms existing state-of-the-art work on shape completion. Abstract: We propose a method for reconstructing 3D shapes from 2D sketches in the form of line drawings. 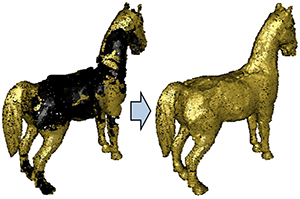 Our method takes as input a single sketch, or multiple sketches, and outputs a dense point cloud representing a 3D reconstruction of the input sketch(es). 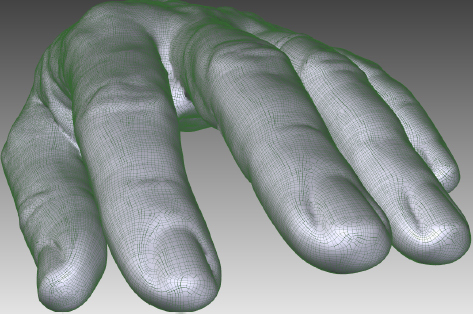 The point cloud is then converted into a polygon mesh. At the heart of our method lies a deep, encoder-decoder network. The encoder converts the sketch into a compact representation encoding shape information. The decoder converts this representation into depth and normal maps capturing the underlying surface from several output viewpoints. The multi-view maps are then consolidated into a 3D point cloud by solving an optimization problem that fuses depth and normals across all viewpoints. Based on our experiments, compared to other methods, such as volumetric networks, our architecture offers several advantages, including more faithful reconstruction, higher output surface resolution, better preservation of topology and shape structure. Abstract: We introduce a deep learning approach for grouping discrete patterns common in graphical designs. Our approach is based on a convolutional neural network architecture that learns a grouping measure defined over a pair of pattern elements. Motivated by perceptual grouping principles, the key feature of our network is the encoding of element shape, context, symmetries, and structural arrangements. These element properties are all jointly considered and appropriately weighted in our grouping measure. To better align our measure with the human perception of grouping, we train our network on a large, human-annotated dataset of pattern groupings consisting of patterns at varying granularity levels, with rich element relations and varieties, tempered with noise and other data imperfections. Our results demonstrate that our deep-learned measure leads to robust pattern groupings. Abstract: This paper introduces a deep architecture for segmenting 3D objects into their labeled semantic parts. Our architecture combines image-based Fully Convolutional Networks (FCNs) and surface-based Conditional Random Fields (CRFs) to yield coherent segmentations of 3D shapes. 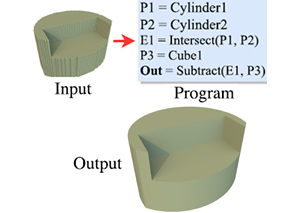 The image-based FCNs are used for efficient view-based reasoning about 3D object parts. 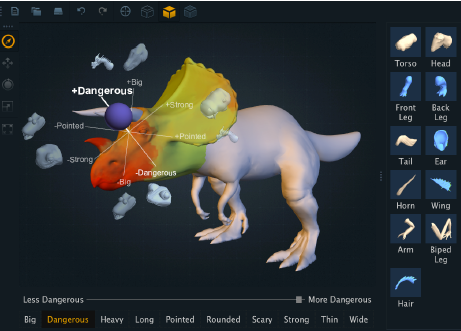 Through a special projection layer, FCN outputs are effectively aggregated across multiple views and scales, then are projected onto the 3D object surfaces. Finally, a surface-based CRF combines the projected outputs with geometric consistency cues to yield coherent segmentations. The whole architecture (multi-view FCNs and CRF) is trained end-to-end. Our approach significantly outperforms the existing state-of-the-art methods in the currently largest segmentation benchmark (ShapeNet). 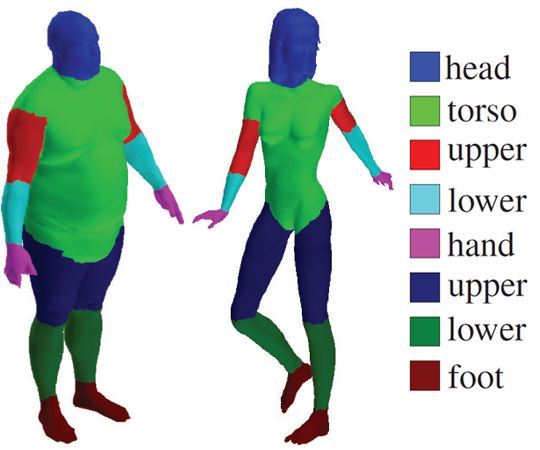 Finally, we demonstrate promising segmentation results on noisy 3D shapes acquired from consumer-grade depth cameras. Abstract: Procedural modeling techniques can produce high quality visual content through complex rule sets. However, controlling the outputs of these techniques for design purposes is often notoriously difficult for users due to the large number of parameters involved in these rule sets and also their non-linear relationship to the resulting content. To circumvent this problem, we present a sketch-based approach to procedural modeling. 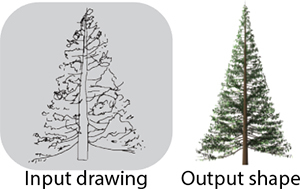 Given an approximate and abstract hand-drawn 2D sketch provided by a user, our algorithm automatically computes a set of procedural model parameters, which in turn yield multiple, detailed output shapes that resemble the user's input sketch. The user can then select an output shape, or further modify the sketch to explore alternative ones. At the heart of our approach is a deep Convolutional Neural Network (CNN) that is trained to map sketches to procedural model parameters. The network is trained by large amounts of automatically generated synthetic line drawings. By using an intuitive medium i.e., freehand sketching as input, users are set free from manually adjusting procedural model parameters, yet they are still able to create high quality content. We demonstrate the accuracy and efficacy of our method in a variety of procedural modeling scenarios including design of man-made and organic shapes. Abstract: Data-driven methods play an increasingly important role in discovering geometric, structural, and semantic relationships between 3D shapes in collections, and applying this analysis to support intelligent modeling, editing, and visualization of geometric data. In contrast to traditional approaches, a key feature of data-driven approaches is that they aggregate information from a collection of shapes to improve the analysis and processing of individual shapes. In addition, they are able to learn models that reason about properties and relationships of shapes without relying on hard-coded rules or explicitly programmed instructions. We provide an overview of the main concepts and components of these techniques, and discuss their application to shape classification, segmentation, matching, reconstruction, modeling and exploration, as well as scene analysis and synthesis, through reviewing the literature and relating the existing works with both qualitative and numerical comparisons. We conclude our report with ideas that can inspire future research in data-driven shape analysis and processing. Abstract: When geometric models with a desired combination of style and functionality are not available, they currently need to be created manually. 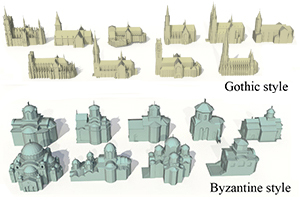 We facilitate algorithmic synthesis of 3D models of man-made shapes which combines user-specified style, described via an exemplar shape, and functionality, encoded by a functionally different target shape. Our method automatically transfers the style of the exemplar to the target, creating the desired combination. The main challenge in performing cross-functional style transfer is to implicitly separate an object's style from its function: while stylistically the output shapes should be as close as possible to the exemplar, their original functionality and structure, as encoded by the target, should be strictly preserved. Recent literature point to the presence of similarly shaped, salient geometric elements as a main indicator of stylistic similarity between 3D shapes. We therefore transfer the exemplar style to the target via a sequence of element-level operations. We allow only compatible operations, ones that do not affect the target functionality. To this end, we introduce a cross-structural element compatibility metric that estimates the impact of each operation on the edited shape. Our metric is based on the global context and coarse geometry of evaluated elements, and is trained on databases of 3D objects. We use this metric to cast style transfer as a tabu search, which incrementally updates the target shape using compatible operations, progressively increasing its style similarity to the exemplar while strictly maintaining its functionality at each step. We evaluate our framework across a range of man-made objects including furniture, light fixtures, and tableware, and perform a number of user studies confirming that it produces convincing outputs combining the desired style and function. Abstract: Recently there has been an increasing demand for software that can help designers create functional 3D objects with required physical strength. We introduce a generic and extensible method that directly optimizes a shape subject to physical and geometric constraints. Given an input shape, our method optimizes directly its input mesh representation until it can withstand specified external forces, while remaining similar to the original shape. Our method performs physics simulation and shape optimization together in a unified framework, where the physics simulator is an integral part of the optimizer. We employ geometric constraints to preserve surface details and shape symmetry, and adapt a second-order method with analytic gradients to improve convergence and computation time. Our method provides several advantages over previous work, including the ability to handle general shape deformations, preservation of surface details, and incorporation of user-defined constraints. We demonstrate the effectiveness of our method on a variety of printable 3D objects through detailed simulations as well as physical validations. Abstract: A longstanding question in computer vision concerns the representation of 3D shapes for recognition: should 3D shapes be represented with descriptors operating on their native 3D formats, such as voxel grid or polygon mesh, or can they be effectively represented with view-based descriptors? We address this question in the context of learning to recognize 3D shapes from a collection of their rendered views on 2D images. We first present a standard CNN architecture trained to recognize the shapes’ rendered views independently of each other, and show that a 3D shape can be recognized even from a single view at an accuracy far higher than using state-of-the-art 3D shape descriptors. Recognition rates further increase when multiple views of the shapes are provided. In addition, we present a novel CNN architecture that combines information from multiple views of a 3D shape into a single and compact shape descriptor offering even better recognition performance. The same architecture can be applied to accurately recognize human hand-drawn sketches of shapes. We conclude that a collection of 2D views can be highly informative for 3D shape recognition and is amenable to emerging CNN architectures and their derivatives. Abstract: The human perception of stylistic similarity transcends structure and function: for instance, a bed and a dresser may share a common style. An algorithmically computed style similarity measure that mimics human perception can benefit a range of computer graphics applications. Previous work in style analysis focused on shapes within the same class, and leveraged structural similarity between these shapes to facilitate analysis. In contrast, we introduce the first structure-transcending style similarity measure and validate it to be well aligned with human perception of stylistic similarity. Our measure is inspired by observations about style similarity in art history literature, which point to the presence of similarly shaped, salient, geometric elements as one of the key indicators of stylistic similarity. We translate these observations into an algorithmic measure by first quantifying the geometric properties that make humans perceive geometric elements as similarly shaped and salient in the context of style, then employing this quantification to detect pairs of matching style related elements on the analyzed models, and finally collating the element-level geometric similarity measurements into an object-level style measure consistent with human perception. To achieve this consistency we employ crowdsourcing to quantify the different components of our measure; we learn the relative perceptual importance of a range of elementary shape distances and other parameters used in our measurement from 50K responses to cross-structure style similarity queries provided by over 2500 participants. We train and validate our method on this dataset, showing it to successfully predict relative style similarity with near 90% accuracy based on 10-fold cross-validation. Abstract: We present a method for joint analysis and synthesis of geometrically diverse 3D shape families. Our method first learns part-based templates such that an optimal set of fuzzy point and part correspondences is computed between the shapes of an input collection based on a probabilistic deformation model. In contrast to previous template-based approaches, the geometry and deformation parameters of our part-based templates are learned from scratch. Based on the estimated shape correspondence, our method also learns a probabilistic generative model that hierarchically captures statistical relationships of corresponding surface point positions and parts as well as their existence in the input shapes. A deep learning procedure is used to capture these hierarchical relationships. The resulting generative model is used to produce control point arrangements that drive shape synthesis by combining and deforming parts from the input collection. The generative model also yields compact shape descriptors that are used to perform fine-grained classification. Finally, it can be also coupled with the probabilistic deformation model to further improve shape correspondence. We provide qualitative and quantitative evaluations of our method for shape correspondence, segmentation, fine-grained classification and synthesis. Our experiments demonstrate superior correspondence and segmentation results than previous state-of-the-art approaches. Abstract: Smoking-induced diseases are known to be the leading cause of death in the United States. In this work, we design RisQ, a mobile solution that leverages a wristband containing a 9-axis inertial measurement unit to capture changes in the orientation of a person’s arm, and a machine learning pipeline that processes this data to accurately detect smoking gestures and sessions in real-time. Our key innovations are fourfold: a) an arm trajectory-based method that extracts candidate hand-to-mouth gestures, b) a set of trajectory-based features to distinguish smoking gestures from confounding gestures including eating and drinking, c) a probabilistic model that analyzes sequences of hand-to-mouth gestures and infers which gestures are part of individual smoking sessions, and d) a method that leverages multiple IMUs placed on a person’s body together with 3D animation of a person’s arm to reduce burden of self-reports for labeled data collection. Our experiments show that our gesture recognition algorithm can detect smoking gestures with high accuracy (95.7%), precision (91%) and recall (81%). 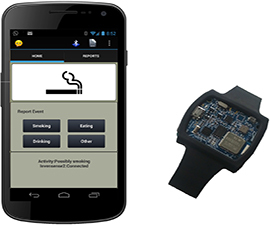 We also report a user study that demonstrates that we can accurately detect the number of smoking sessions with very few false positives over the period of a day, and that we can reliably extract the beginning and end of smoking session periods. Abstract: Style transfer aims to apply the style of an exemplar model to a target one, while retaining the target’s structure. The main challenge in this process is to algorithmically distinguish style from structure, a high-level, potentially ill-posed cognitive task. We recast style transfer in terms of shape analogies. We use the proposed framework to seamlessly transfer a variety of style properties between 2D and 3D objects and demonstrate significant improvements over the state of the art in style transfer. We further show that our framework can be used to successfully complete partial scans with the help of a user provided structural template, coherently propagating scan style across the completed surfaces. Abstract: We present ATTRIBIT, an approach for people to create visual content using relative semantic attributes expressed in linguistic terms. During an off-line processing step, ATTRIBIT learns semantic attributes for design components that reflect the high-level intent people may have for creating content in a domain (e.g., adjectives such as “dangerous,” “scary,” or “strong”) and ranks them according to the strength of each learned attribute. Then, during an interactive design session, a person can explore different combinations of visual components using commands based on relative attributes (e.g. “make this part more dangerous”). Novel designs are assembled in real-time as the strength of selected attributes are varied, enabling rapid, in-situ exploration of candidate designs. We applied this approach to 3D modeling and web design. Experiments suggest this interface is an effective alternative for novices performing tasks with high-level design goals. Abstract: We present a novel particle-based method for stable simulation of elasto-plastic materials. The main contribution of our method is an implicit numerical integrator, using a physically-based model, for computing particles that undergo both elastic and plastic deformations. The main advantage of our implicit integrator is that it allows the use of large time steps while still preserving stable and physically plausible simulation results. As a key component of our algorithm, at each time step we compute the particle positions and velocities based on a sparse linear system, which we solve efficiently on the graphics hardware. Compared to existing techniques, our method allows for a much wider range of stiffness and plasticity settings. In addition, our method can significantly reduce the computation cost for certain range of material types. We demonstrate fast and stable simulations for a variety of elasto-plastic materials, ranging from highly stiff elastic materials to highly plastic ones. Abstract: We present an approach to synthesizing shapes from complex domains, by identifying new plausible combinations of components from existing shapes. 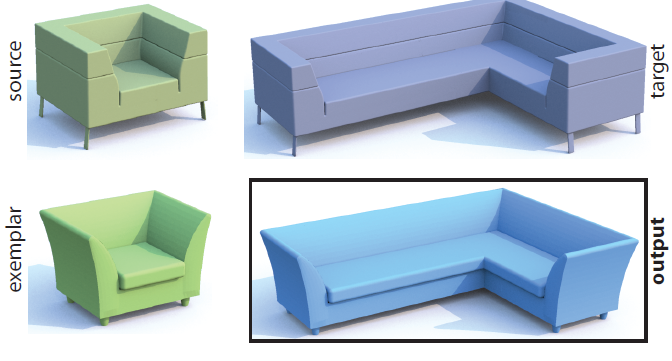 Our primary contribution is a new generative model of component-based shape structure. The model represents probabilistic relationships between properties of shape components, and relates them to learned underlying causes of structural variability within the domain. These causes are treated as latent variables, leading to a compact representation that can be effectively learned without supervision from a set of compatibly segmented shapes. We evaluate the model on a number of shape datasets with complex structural variability and demonstrate its application to amplification of shape databases and to interactive shape synthesis. Abstract: This paper presents an algorithm for learning hatching styles from line drawings. An artist draws a single hatching illustration of a 3D object. Their strokes are analyzed to extract the following per-pixel properties: hatching level (hatching, cross-hatching, or no strokes), stroke orientation, spacing, intensity, length, and thickness. A mapping is learned from input features to these properties, using classification, regression, and clustering techniques. Then, a new illustration can be generated in the artist’s style, as follows. First, given a new view of a 3D object, the learned mapping is applied to synthesize target stroke properties for each pixel. 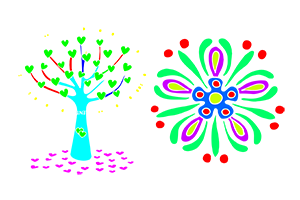 A new illustration is then generated by synthesizing hatching strokes according to the target properties. Abstract: Assembly-based modeling is a promising approach to broadening the accessibility of 3D modeling. In assembly-based modeling, new models are assembled from shape components extracted from a database. A key challenge in assembly-based modeling is the identification of relevant components to be presented to the user. In this paper, we introduce a probabilistic reasoning approach to this problem. Given a repository of shapes, our approach learns a probabilistic graphical model that encodes semantic and geometric relationships among shape components. 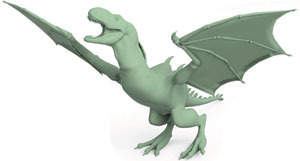 The probabilistic model is used to present components that are semantically and stylistically compatible with the 3D model that is being assembled. Our experiments indicate that the probabilistic model increases the relevance of presented components. Abstract: This paper presents a data-driven approach to simultaneous segmentation and labeling of parts in 3D meshes. An objective function is formulated as a Conditional Random Field model, with terms assessing the consistency of faces with labels, and terms between labels of neighboring faces. The objective function is learned from a collection of labeled training meshes. The algorithm uses hundreds of geometric and contextual label features and learns different types of segmentations for different tasks, without requiring manual parameter tuning. Our algorithm achieves a significant improvement in results over the state-of-the-art when evaluated on the Princeton Segmentation Benchmark, often producing segmentations and labelings comparable to those produced by humans. Abstract: This paper presents a method for estimating geographic location for sequences of time-stamped photographs. A prior distribution over travel describes the likelihood of traveling from one location to another during a given time interval. This distribution is based on a training database of 6 million photographs from Flickr.com. An image likelihood for each location is defined by matching a test photograph against the training database. 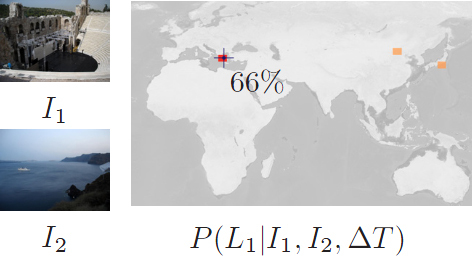 Inferring location for images in a test sequence is then performed using the Forward-Backward algorithm, and the model can be adapted to individual users as well. Using temporal constraints allows our method to geolocate images without recognizable landmarks, and images with no geographic cues whatsoever. This method achieves a substantial performance improvement over the best-available baseline, and geolocates some users’ images with near-perfect accuracy. Abstract: This paper presents a method for real-time line drawing of deforming objects. Object-space line drawing algorithms for many types of curves, including suggestive contours, highlights, ridges and valleys, rely on surface curvature and curvature derivatives. Unfortunately, these curvatures and their derivatives cannot be computed in real-time for animated, deforming objects. 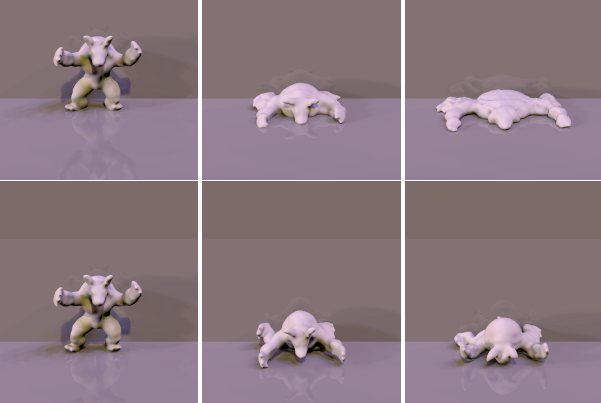 In a preprocessing step, our method learns the mapping from a low-dimensional set of animation parameters to surface curvatures for a deforming 3D mesh. The learned model can then accurately and efficiently predict curvatures and their derivatives, enabling real-time object-space rendering of suggestive contours and other such curves. This represents an order-of-magnitude speed-up over the fastest existing algorithm capable of estimating curvatures and their derivatives accurately enough for many different types of line drawings. The learned model can generalize to novel animation sequences, and is also very compact, requiring a few megabytes of storage. We demonstrate our method for various types of animated objects, including skeleton-based characters, cloth simulation and facial animation, using a variety of non-photorealistic rendering styles. Abstract: In this paper, we perform segmentation and labeling of shapes based on a simultaneous optimization of multiple heterogenous objectives that capture application-specific segmentation criteria. We present a number of efficient objective functions that capture useful shape adjectives (compact, flat, narrow, perpendicular, etc.) Segmentation descriptions within our framework combine multiple such objective functions with optional labels to define each part. The optimization problem is simplified by proposing weighted Voronoi partitioning as a compact and continuous parametrization of spatially embedded shape segmentations. This partition is automatically labeled to optimize heterogeneous part objectives and the Voronoi centers and their weights optimized using Generalized Pattern Search. 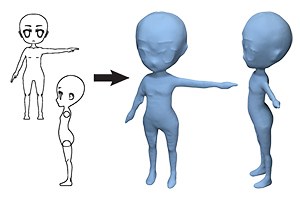 We illustrate our framework using several diverse segmentation applications: bounding volume hierarchies for path tracing, and automatic rig and clothing transfer between animation characters. Abstract: We present a real-time relighting and shadowing method for dynamic scenes with varying lighting, view and BRDFs. Our approach is based on a compact representation of reflectance data that allows for changing the BRDF at run-time and a data-driven method for accurately synthesizing self-shadows on articulated and deformable geometries. Unlike previous self-shadowing approaches, we do not rely on local blocking heuristics. We do not fit a model to the BRDF-weighted visibility, but rather only to the visibility that changes during animation. 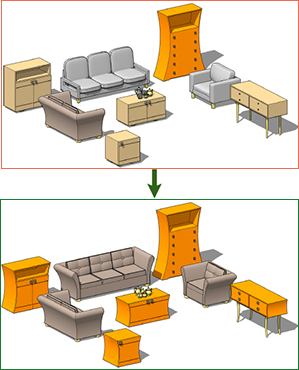 In this manner, our model is more compact than previous techniques and requires less computation both during fitting and at run-time. Our reflectance product operators can re-integrate arbitrary low-frequency view-dependent BRDF effects on-the-fly and are compatible with all previous dynamic visibility generation techniques as well as our own data-driven visibility model. We apply our reflectance product operators to three different visibility generation models, and our data-driven model can achieve framerates well over 300Hz. ective over a range of synthetic and real-world input datasets with varying amounts of noise and outliers. 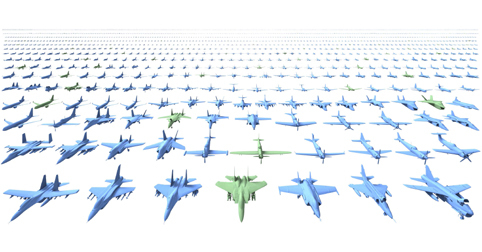 The extraction of curvature information can benefit many applications in CAD, computer vision and graphics for point cloud shape analysis, recognition and segmentation. Here, we show the possibility of using the lines of curvature for feature-preserving mesh construction directly from noisy point clouds. Abstract: We present a method for creating a geometry-dependent basis for precomputed radiance transfer. Unlike previous PRT bases, ours is derived from principal component analysis of the sampled transport functions at each vertex. It allows for efficient evaluation of shading, has low memory requirements and produces accurate results with few coefficients. We are able to capture all-frequency effects from both distant and near-field dynamic lighting in real-time and present a simple rotation scheme. Reconstruction of the final shading becomes a low-order dot product and is performed on the GPU. Abstract: A robust statistics approach to curvature estimation on discretely sampled surfaces, namely polygon meshes and point clouds, is presented. The method exhibits accuracy, stability and consistency even for noisy, non-uniformly sampled surfaces with irregular configurations. Within an M-estimation framework, the algorithm is able to reject noise and structured outliers by sampling normal variations in an adaptively reweighted neighborhood around each point. The algorithm can be used to reliably derive higher order differential attributes and even correct noisy surface normals while preserving the fine features of the normal and curvature field. The approach is compared with state-of-the-art curvature estimation methods and shown to improve accuracy by up to an order of magnitude across ground truth test surfaces under varying tessellation densities and types as well as increasing degrees of noise. Finally, the benefits of a robust statistical estimation of curvature are illustrated by applying it to the popular applications of mesh segmentation and suggestive contour rendering. Abstract: Meshes representing real world objects, both artist-created and scanned, contain a high level of redundancy due to approximate planar reflection symmetries, either global or localized to different subregions. An algorithm is presented for detecting such symmetries and segmenting the mesh into the symmetric and remaining regions. The method has foundations in robust statistics and is resilient to structured outliers which are present in the form of the non symmetric regions of the data. 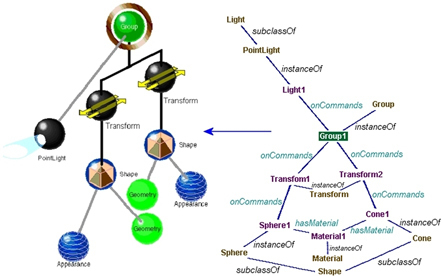 Also introduced is an application of the method: the folding tree data structure. The structure encodes the non redundant regions of the original mesh as well as the reflection planes and is created by the recursive application of the detection method. This structure can then be unfolded to recover the original shape. Applications include mesh compression, repair as well as mesh processing acceleration by limiting computation to non redundant regions and propagation of results. Abstract: A great challenge in information visualization today is to provide models and software that effectively integrate the graphics content of scenes with domain-specific knowledge so that the users can effectively query, interpret, personalize and manipulate the visualized information. Moreover, it is important that such applications are interoperable in the semantic web environment and thus, require that the models and software supporting them integrate state-of-the-art international standards for knowledge representation, graphics and multimedia. In this paper, we present a model and a software framework for the semantic web for the development of interoperable intelligent visualization applications that support the coupling of graphics and virtual reality scenes with domain knowledge of different domains. We also provide methods for knowledge driven information visualization and visualization-aided decision making based on inference by reasoning.